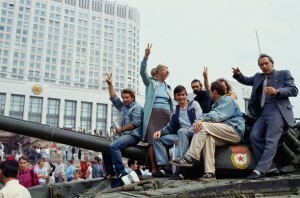 Muscovites mount a tank during the protests against the 1991 attempted coup in Russia. Photo by Shepard Sherbell / Corbis, via TIME. We’re used to it by now: once an invention gets established, people add applications of it to situations the originators never imagined. This seems to be just as true with social inventions, such as nonviolent action. I’m remembering a workshop that exiled Palestinian Mubarak Awad and I were leading in Washington. Among the activists in the workshop were several of the lead organizers from an eco-justice organization, and they started leaning forward when I described differences between nonviolent action when used for change and when used for defense. I could almost see thought bubbles forming over their heads, the concentration was so intense. The difference was something they’d seen again and again but didn’t know how to name. The other organizers with her laughed. The change application is the default for many activists. But defense often has more capacity to galvanize. Last year in Wisconsin, for instance, 100,000 people occupied the state capitol to defend the public employees’ unions. In fact, of the approximately 600 cases in the Global Nonviolent Action Database, over 200 are defense cases, altogether involving tens of millions of people. In 1991, the KGB and hard-line Communist Party leaders arrested Premier Gorbachev and tried to implement a coup d’etat. A tremendous nonviolent resistance movement spontaneously erupted. Crowds stopped tanks without barricades. Troops began to refuse to follow orders. The coup failed; Gorbachev resumed office and sacked the plotters. As that struggle unfolded I was optimistic, remembering a previous large-scale successful nonviolent defense against a coup d’etat, in France, when some army generals tried to impose their rule in the place of de Gaulle in 1962. But 10 million workers joined the noncooperation strategy, and the coup attempt was defeated. Each day during the Russian defense of ’91, I was getting emails in Philadelphia from Russian friends whom I knew because I had been coaching them in facilitation skills. Naturally, on my next trip to Moscow to work with them I was eager to hear their own stories of what the resistance was like. They changed the subject, and so did other Russians I met on that trip. I didn’t get why, but there was a lot about Russian culture I didn’t get, so I shut up. Finally, while drinking vodka with my comrades the night before leaving, I asked them why they didn’t want to talk about their participation in a world-class act of nonviolent resistance. At last I understood. They had done a brilliantly successful defense of the status quo (i.e., the liberalizing Gorbachev and glasnost and perestroika), but at the time they thought they were making revolutionary change. Of course they were disappointed. We talked long into the night about how different a revolutionary strategy in Russia would have to be from their anti-coup resistance, and how it’s often the case that defense is easier than change. Defense shows up more frequently on a smaller scale — for example, neighborhoods defending themselves against the threat of an expressway coming through. Some urban black neighborhoods in the U.S. used nonviolent action to fight the invasion of drug dealers; they marched, prevented drug dealers from using favorite street corners, and even used sledgehammers to beat down the doors of crack (cocaine) houses and chant their way inside while the dealers ran out the back! Sometimes, actually, a situation can be read either way: either the change app or the defense app could probably succeed. That was true in Philadelphia when some friends of mine decided to organize a campaign against the USA Patriot Act, a repressive law already passed by Congress and President George W. Bush in 2001. My friends wanted the City Council to vote against participation in the act, not only to lay the groundwork for future noncooperation and non-enforcement, but also to help build the national movement against Patriot Act II. My friends knew about the choice of apps and realized they could plausibly frame their campaign as either change or defense. The Patriot Act already existed, so they could proclaim their intention to change or abolish it, starting in Philly. Or they could announce that they were defending Philadelphia against this imposition from Washington. Either way they framed it, they would demand that the City Council come out against the act. They decided on defense because it might then be easier to claim the legacy of Philadelphia as the place where the U.S. Constitution was written and as the site of the Liberty Bell; the campaign would be defending liberty. Their choice worked well; they got far beyond “the usual suspects” of familiar social activist coalitions. I thoroughly enjoyed going to the City Council chamber for the final vote, surrounded by hundreds of leaders from organizations that didn’t consider themselves “activist” but were proud to come to defend the liberties of their country. The City Council knew which way to vote. The third app is, as far as I know, new in its organized strategic use. Civilian peacekeeping, also called third party nonviolent intervention (TPNI), began to emerge in the 1960s. Shanti Sena, the Indian Peace Brigade, intervened multiple times in Hindu/Muslim riots to reduce injuries and deaths and end the fighting. In Baroda, Gujarat, for example, its 1965 intervention included going directly into violent streets and risking injury from rioters and the police. Then, in a daring move in the 1970 riot in Bhiwanda, a largely Hindu group of peacekeepers ostentatiously slept as guests in a house in a Muslim neighborhood, surprising local Hindus that the peacekeepers could escape alive from the Muslim “monsters.” Shanti Sena grew to 6,000 volunteers at its peak. When I taught a group of graduate students recently about such third-party nonviolent intervention, one of the students told us that she earns her way through school by bartending, “I break up fights on a lot of Saturday nights doing exactly what you’re talking about,” she said. Like other apps of nonviolent action, TPNI draws on human nature and what countless numbers of people do in everyday life. Recreation leaders in community centers tell stories of stepping between upset young people when tension rises during a basketball game. I’ve heard stories of individual members of the clergy and nuns going to picket lines in coal country in order to protect miners from assault by company thugs; they’d found that “stepping in between” minimized the damage. The cases in the Global Nonviolent Action Database include examples of much more organized action. The Movement for a New Society, for one, sent carloads of activists to Wounded Knee in South Dakota to get between the federal troops who were in armed confrontation with the occupation by members of the American Indian Movement. MNS succeeded in stalling the violence for their first few days on the scene but were eventually forced out by the government. The earliest instance I know about of an international organization adopting TPNI was in the early 1980s. Peace Brigades International (PBI) volunteers became unarmed bodyguards for human rights activists who were threatened with assassination in the police states of El Salvador and Guatemala. PBI’s tactic, formally called protective accompaniment, is different from the kind of third-party work we call mediation. In mediation and other forms of alternate dispute resolution, the third party assists two parties who are ready to talk even if they are still fighting. The mediator sits down with the parties in a room, or shuttles between them to keep communication going. The extraordinary thing about third party nonviolent intervention is that it is an app to use when the two parties won’t talk or negotiate, and one or both simply wants to keep fighting. In fact, the app is not really for conflict resolution — it’s for increasing the safety in which the conflict can continue to be waged. That’s why I call it “nonviolent action,” rather than a technique for resolving conflict. I have no doubt that additional applications will be found for nonviolent action, because organizers are always looking for ways to stand up for themselves and others. Distinguishing among the three so far identified — change, defense, and third-party nonviolent intervention — gives us a head start on strategy. We won’t act like social-change activists when defense is what people want. We won’t waste our time “speaking truth to power” when it’s change that we want. And we’ll know how to profile ourselves for maximum leverage when we’re seeking to protect others from victimization. Most of all, we’ll experience ourselves as more powerful in those situations where it’s a judgment call; we can decide for ourselves whether we’ll win more easily by framing our campaign as one app or another. Being able to strategize this way puts us ahead of previous generations, and it makes victories even more likely in our future.